Had an interesting thing happen just now. While playing ATB an enemy Mongoose was stuck in a swamp hex. I blasted it and destroyed it's gyro. So now it was face down stuck in the swamp unable to get up. However the next movement phase it got to roll to get unstuck and even with the gyro penalty it got a 12 and some how got unstuck from the swamp. This has me a little boggled. I know a mech with no gyro can turn facings by crawling in a circle, but for the life of me I just can't picture how you could get a mech unstuck from a swamp without a gyro. Is this expected behavior? I don't remember the rules for swamps so maybe this has been asked and answered before. What do you guys think, should a gyro be required to try to get unstuck from a swamp? I guess if a mech without a gyro can still crawl, then it can crawl itself free from muck. For all the good that'll actually do it. I suspect it's a by-product of the RAW. Best would be to ask for a rules clarification. Damaged Gyro (1-hit) or Destroyed Gyro (2+ hits)? Destroyed Gyro 'Mechs can't crawl (per TacOops). Or . . . MM measures things differently? 2 hits to the gyro does not make a mech destroyed in MM IIRC? I don't think it AUTOMATICALLY makes it destroyed, depending on your optional settings. It does make it immobile, and I don't believe it can fire weapons, so it's "effectively" destroyed for combat purposes, even if it's still shown as "active" in the game. 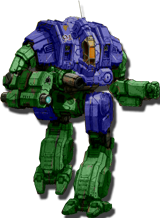 Again, depending on your settings, the MechWarrior either will automatically, or will not necessarily, eject. The game configurations go beyond "official optional rules" and include several "house rules" settings. I think it can prop & still shoot . . . I know it was one of the frustrations before with one of the MM servers a few years ago- 2 gyro hits and it should be salvage. If you did not manage to knock it out, then a gyro'd mech could still be a init sink. I'm a few versions behind but yeah no gyro you can still prop and shoot, depending on what options for firing prone you have. You also are not immobile even with no gyro and both legs gone as you can change facing to get a better firing arc. I know sometimes a prone mech gets an option to punch if there is an available target, not sure if that can be done with no gyro. I would think you would need a gyro to make physical attacks, without just smashing your prone mech back into the ground. I suspect that the ONLY attack you can do without a gyro is a "thrash" at infantry in your hex, and I'm not sure if even that is allowed. I seem to recall that weapons fire relied on gyro information, so you couldn't target anything without a functional gyro....which seems a bit odd (it should probably give a penalty to tracking moving targets or something), but I think that was the basic rule. Optional rules relax a lot of the requirements, so you probably CAN fire weapons if you're playing with those optional rules. The various generations of rule books (dating back to the Compendium or earlier) are at home, so I can't look it up here. Firing torso and one arm's weapons with no legs was allowed, but I seem to remember that 2 gyro hits was considered a "mission kill" and removed from play. Original rules (p18, and Total Warfare p126) state that a destroyed gyro does not render a 'mech immobile, you can turn one hex (with 1 MP), and you can fire under the prone rules. If you're playing with forced withdrawal, then a destroyed gyro would remove the 'mech from play. TacOps says you cannot crawl with a destroyed gyro, and you wouldn't be able to grapple. Interesting point to note about grappling - while damaged actuators (including those in the legs) add to the modifier, it doesn't seem to state that the attacker must be standing... or even facing the target. BattleMech capoeira here we go! This calls for a new physical attack- the Shoestring Tackle!